I left Distant Voices Touring Theatre’s afternoon salon with a lot to think about. 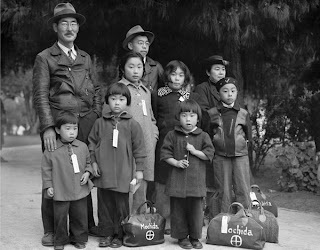 Like most people, I had learned about the internment of Japanese Americans during World War II in school. Yet the group’s vivid portrayal of Hiroaki Nishimura’s experience as an internee communicated this despicable chapter in our country’s history in a very personal, poignant way. Founded in 1999 by Julie Nishimura and Danny Peak, the theater group produces and tours original plays based on American social justice events and issues. Actors Michelle Jacob Stradley, David Stradley and Danny Peak create the scene of Hiroaki Nishimura’s stark existence as a prisoner. Julie Nishimura plays a touching and powerful accompaniment on the piano. The music is by composers such as Copland, Debussy and Gershwin. Nishimura also plays compositions commissioned from Robert Hogenson, which are based on Japanese children’s music and folk songs. Hiroaki Nishimura was interned in 1942 along with about 110,000 other Japanese Americans and Japanese. Though he becomes just “number 14786” to the US Government, he still takes pride in his country, celebrating the 4th of July along with fellow internees. It is not until 1960 that he is repatriated as an American citizen. The play, based on writings from his diary, details his dehumanizing experience. The story of Hiroaki Nishimura, Julie Nishimura’s father and Danny Peak’s father-in-law, is an also an excellent teaching resource. The group has toured extensively in colleges and schools in this country and to the Artslink Festival in England. They have been recognized by Pacem in Terris with the Peacemakers Among Us award. The group also performed portion of September Echoes, commission by Saints Andrew and Matthew church in Wilmington. The play deals with the repercussions of 9/11, while exploring themes of racism and human rights. Michelle Jacob Stradley plays Nadin Hamoui, a young Syrian-American who is jailed along with her mother, who eventually dies. The parallels between the internments of the Japanese Americans and the treatment of Arabs and Arab Americans are unmistakable. With their thought provoking and moving pieces, perhaps Distant Voices Touring Theatre might help keep history from repeating itself. The group will perform Distant Voices in its entirety at the Newark Public Library on April 29 at 2:00. Thank you so much for the wonderful write-up, Jessica. Unfortunately, the website (dvtt.net) is a bit outdated but we are working on fixing this soon. So, for now, we do recommend the FB group page.